The System - Livestock Water Recycling, Inc.
Our patented process technology uses both mechanical and chemical treatments to remove manure contaminants and segregate valuable fertilizer nutrients at large livestock operations. As the manure effluent flows through the process, solids are sequentially removed. The result is valuable segregated fertilizer nutrients and clean water that can be reused around the barns. 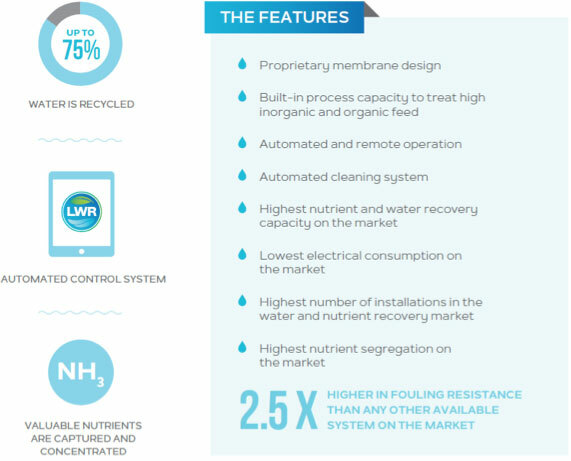 The nutrient and water recovery capacity of the LWR System is the highest on the market. 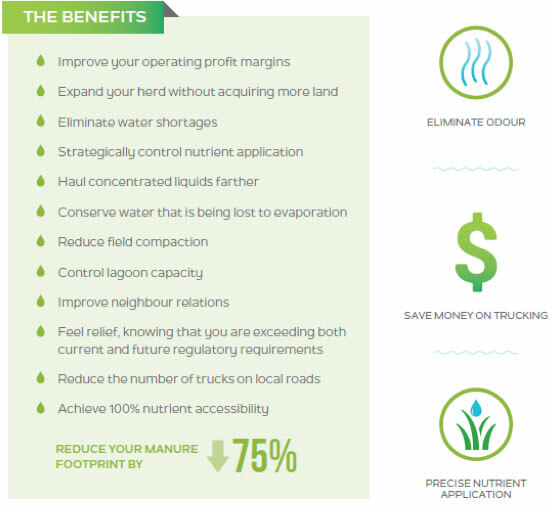 Our process extracts up to 75% of the water from manure while concentrating and segregating nutrients. By concentrating and segregating the nutrients, you are given more control over your nutrient application which minimizes your field work. The result is clean, potable water, dry solids that are rich in both phosphorus and organic nitrogen and a concentrated stable ammonium and potassium liquid. The water from the LWR System is completely safe and suitable for discharge. The process removes all disease-causing pathogens found in livestock manure and can be used for flushing the barns, irrigation and consumption. With a new source of renewable, clean water, your farm will be cleaner and your manure management more efficient. The manure, once treated, is significantly reduced in volume, taking stress off of historically full lagoons and storage pits. 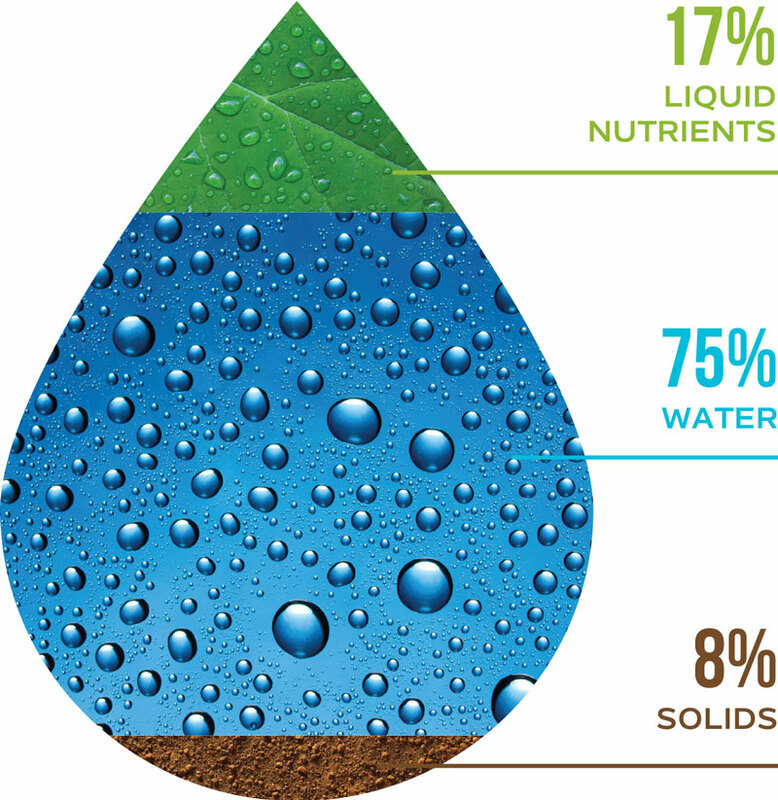 Nutrients can be applied once a year at the optimal time for crop growth, maximizing their value. Eliminate nutrient overload by strategically applying fertilizer as needed, where necessary, eliminating any risk of nutrient runoff. Excess nutrients can be sold to create an additional revenue stream. LWR's System is able to completely treat livestock effluent - it recycles all parts of the manure so that they can be reused at the farming operation. There is zero discharge and no additional equipment is needed to ensure proper treatment. Unlike other effluent treatment systems, LWR's system recovers clean water which will not contaminate groundwater sources and also concentrates the nutrients in the effluent to significantly reduce handling and transport costs. Solving global water challenges, along with meeting industry and customer demands, is the backbone to innovation. LWR is proud to partner with GE, a company focused on growing, adapting and developing technology solutions to tackle these emerging trends.